If you are the proud parent of twins, congratulations! But now you need two of everything, except a stroller. Every outing can be made much easier if you buy a double stroller. Now, you might think that a double stroller will be a heavy, cumbersome vehicle that’s going to be a struggle to push and a nightmare to store and put into your car trunk. Not so! In this article, we take a look at two super-lightweight double umbrella strollers that could be the answer to your prayers; the Joovy Twin Groove Ultralight and the Maclaren Triumph. Umbrella strollers are much lighter than their regular stroller counterparts. The idea is that you can easily fold the stroller and carry it, as you would a large golfing umbrella. So, days out using your car, public transport, and even by airplane should be a hassle-free experience, even with twins. Of course, there are a few important differences between umbrella strollers and regular strollers. For more helpful information on this, take a look at our article on the subject. 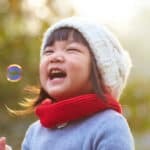 Joovy is a relative newcomer to the children’s equipment marketplace. The U.S. company is based in Dallas, Texas. 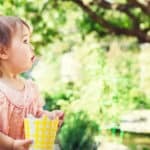 They make a wide range of strollers, including bike trailer strollers, and also manufacture high chairs, play yards, toys, and other baby gear. All of Joovy’s products are designed by family people who are familiar with the problems faced by modern parents. 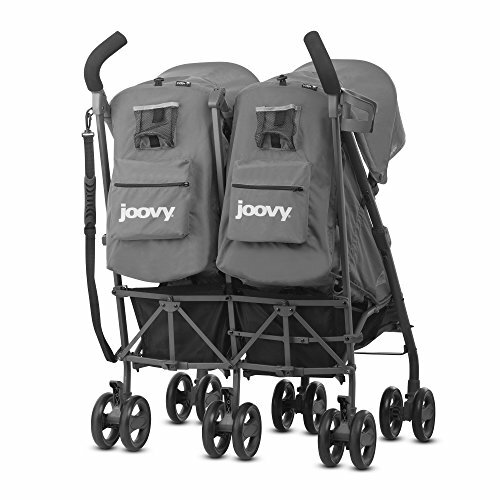 Joovy’s strollers are made to last and are designed to be practical yet stylish. So, although your Joovy stroller may eventually begin to look well-worn, that’s all part of the memory-making process, and it should last you forever. The Twin Groove Ultralight is well-built and smart, and designed for families who live the urban life. The stroller is lightweight with plenty of storage, large canopies, and a handy shoulder strap for easy carrying when necessary. The Twin Groove comes in a lovely range of chic, modern colors, including turquoise, black, and charcoal. The fabric used is high-quality and water-resistant. You can check out the Joovy Twin Groove in action in their official promotional video at this link. The Twin Groove has seats that offer an almost flat recline. That means you can use the stroller for newborns right through to kids weighing up to 50 lbs. Having said that, the seats aren’t terribly big or tall so that you may find the realistic weight limit closer to 40 lbs for comfort. That could be a problem for you if you have two large children. Also, although the seats recline easily via a pull-cord, you will need two hands and a bit of fiddling to un-recline them. Both seats have an individual calf rest, allowing infants and young toddlers to lay flat. There’s an infant mesh boot to provide a safe enclosure for small babies. Each seat has a five-point harness that’s toddler-proof but can be easily opened by an adult. The seats have interior mesh storage pockets that will comfortably fit sippy cups and a few small toys, so older children can help themselves, saving you from having to stop every time your child wants a drink. The underseat storage baskets are pretty generous and will take diaper bags and a small amount of shopping or baby essentials. Note that you can only access the baskets from the rear of the stroller. Extra bags can be hung from the stroller handles quite safely but only when the stroller is loaded with passengers! There are additional storage pockets on the back of the stroller that will easily take your wallet, phone, keys, etc. There are also cup holders for parents, which is a nice finishing touch. For an umbrella stroller, the Twin Groove’s canopies are definitely on the large side. Each canopy has a plastic peek-a-boo window. Unfortunately, the closures are Velcro, making them rather noisy. Silent magnetic closures would be better, especially if you have small babies or toddlers who like to nap. The Twin Groove’s handles are foam-coated and turn inward, making them easy to hold. That said, you will need two hands to push and steer this stroller. The Twin Groove is 30” wide and will fit through standard store doorways and handicapped accessible aisles. The fold is compact, measuring 15” x 30” x 13” and it has adjustable carry straps. The stroller weighs 26 lbs, making it much lighter than most regular double strollers. The Twin Groove has a full three set of wheels, making it very maneuverable. Unfortunately, the rear center wheels might impede the stride of taller parents. The wheels can be locked or left free to swivel. All the wheels have suspension, making the ride smoother over uneven sidewalks or bumpy ground. Also, three brakes must all be engaged separately. Note that the stroller is not the most flip-flop or sandal-friendly. Maclaren was founded by a British aeronautical engineer, Owen Maclaren in 1965. He used tubular aluminum to create the world’s first prototype umbrella stroller. The design was super-light at just 6 lbs and could be folded up with one hand, just like an umbrella. And thus the first modern “umbrella stroller” was born. 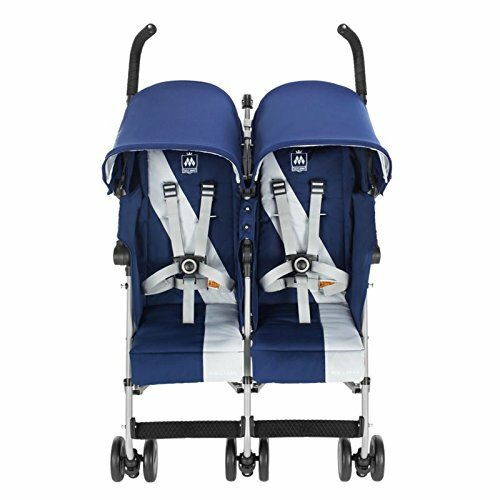 Since 1965, Maclaren has added many styles and types of strollers to their range. You can read more about their range in this post. For a peek at the Twin Triumph in action, take a look at Maclaren’s promo video of this stroller at this link. The Maclaren Twin Triumph wins fans for its ease of maneuverability and no-fuss design that will last you for years. 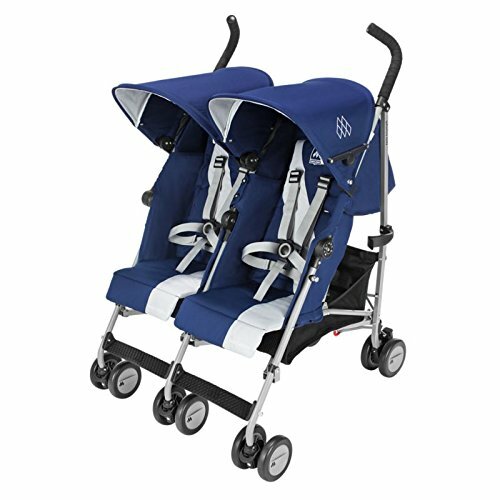 The Twin Triumph is a compact, lightweight double stroller, weighing in at just 21.6 lbs, making it a few pounds lighter than the Joovy Twin Groove. The Triumph has a similar weight capacity to the Twin Groove of 110 lbs. Looks-wise, the Twin Triumph has a nice color range, including black on a charcoal frame, scarlet, green, and grey, both on silver frames. And all colors feature a sporty racing stripe down each seat! The Twin Triumph is super-lightweight! That’s a very big bonus for you if you’re likely to be pushing two hefty toddlers in it. 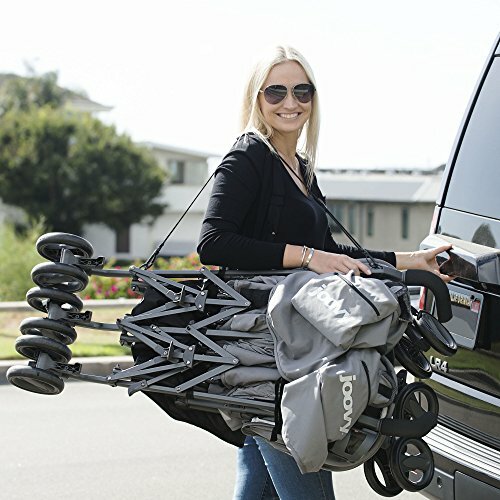 The stroller’s featherweight also makes it extremely easy to lift in and out of your car. The stroller is also very compact, so it’s perfect for indoor storage. Unlike the Joovy Twin Groove, you can fold the Maclaren Twin Triumph stroller quickly and easily with just one hand. The stroller can be folded with the seats reclined and with the foot and head barriers in place. There’s a handy clip on either side that snaps into place to keep the stroller shut. When the stroller is folded, you can use the carry handle on the side to move it around. 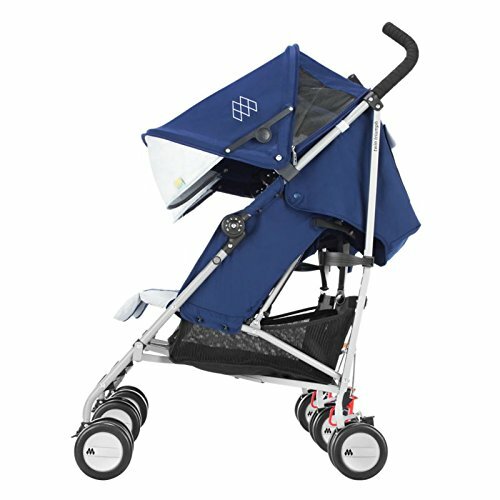 The Maclaren Twin Triumph has two ergonomically angled handles at each side of the stroller that make it easy and comfortable to push. Soft, textured non-slip padding is used to cover the handles. Unfortunately, to keep the weight of the stroller to the minimum, the underseat storage basket isn’t as big as that of the Twin Groove. Also, because the stroller is so light, you can’t safely hang your shopping on the handles, as there’s a danger that the whole thing will tip over. Accessing the storage basket can be tricky, as it’s not very easy to get to when the seats are reclined. Although you can buy one as an extra, you don’t get a cup holder included with the Twin Triumph which you do with the Joovy Twin Groove. Each seat of the Twin Triumph has an individual canopy. 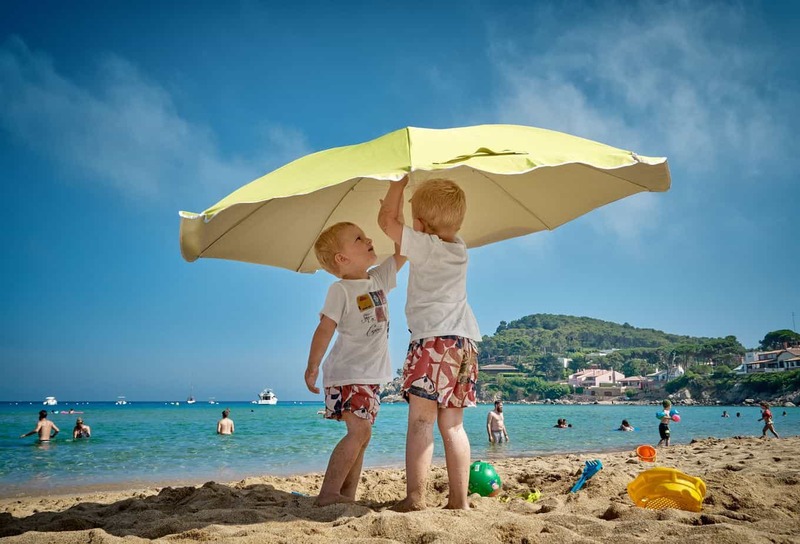 The canopies are very generous and deep, giving great protection for your child from the wind and sun. Unlike the Twin Groove, you get a free rain cover included that fits over both seats simultaneously. There are clips on each side of the stroller to keep the rain cover secure once it’s folded. Without the rain cover, the canopies are water-resistant, which is fine if you need to dash through a quick shower. There are inbuilt viewing windows at the rear of each canopy so that you can keep an eye on your children. Like the Joovy, there are handy pockets on the back of the canopies for essentials. One issue is that the viewing windows don’t have covers, and that could be a problem on a very sunny day if your child is napping or a baby is fully reclined. However, thanks to the positioning of the viewing window, it’s unlikely that the sun would ever shine directly onto a child’s face. Both seats have an independent recline feature, making this a great option for a baby and a toddler; your baby can sleep while your toddler can sit up and enjoy the ride! However, the incline is operated via a basic clipped, adjustable strap at the rear of each seat, and although that gives you an infinite amount of reclined positions for your passenger, the seat recline can be fiddly to adjust. Like the Twin Groove, the seats of the Twin Triumph are pretty narrow. That’s great for fitting the stroller through doorways, and although narrow seats aren’t an issue for young babies, bigger toddlers may find the stroller restrictive. The seats have a partial recline feature, but it’s debatable whether the stroller is suitable for newborns because you can’t put the seats completely flat. Each seat has head and foot barriers that can be set up for use with very small babies, preventing your child from slipping out of the seat. These are stowed behind the seat. For additional security and comfort for newborns, you can invest in comfort packs that include a headrest, shoulder pads, and seat liners. There’s no calf rest with this stroller which there is with the Joovy, but the front edge of the seats is very soft and should be comfy enough for little legs. The seat fabric is removable and washable. The Twin Triumph will fit easily through standard store doorways and handicapped accessible aisles, and it’s pretty easy to maneuver. The stroller has six sets of doubled, hard plastic wheels. The stroller’s wheels can swivel and are also lockable. However, the wheels are quite small, smaller than those on the Twin Groove, making this stroller tricky to handle on uneven surfaces such as gravel or grass. Also, the Twin Triumph lacks the suspension of the Joovy Twin Groove, so your children could be in for a rather bumpy ride. You can just about push the stroller with one hand, but it’s not easy to keep the steering straight if you do. 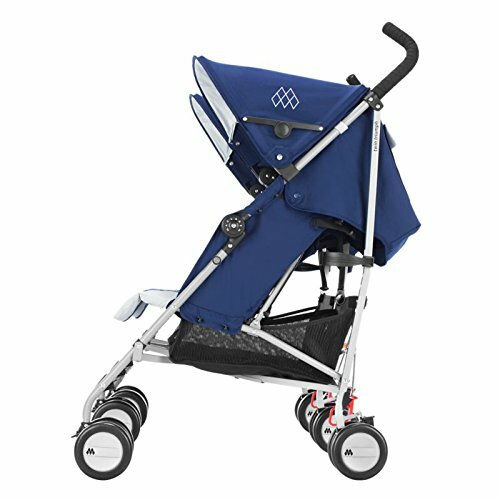 The stroller has a linked brake, making it much easier to engage than the Joovy Twin Groove’s multiple single braking system. Also, the brake is very easy to apply no matter what footwear you’re wearing and gives you a reassuring clunk when it’s engaged. 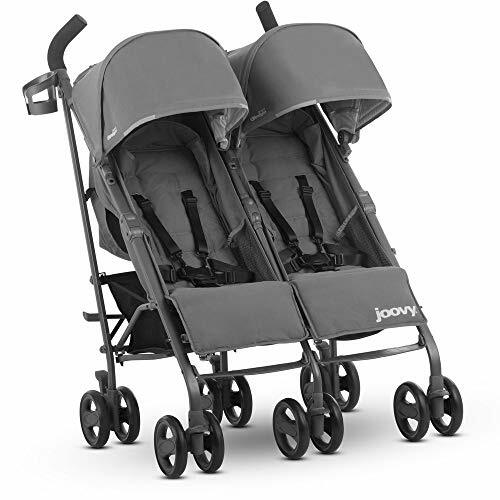 The Joovy Twin Groove and Maclaren Triumph are both lightweight double umbrella strollers that would suit you perfectly if you have twins and live an urban lifestyle. Both are very well-made, come in a good range of colors, and should last you for years. Both strollers are equipped with generous canopies, are easy to fold, and will fit neatly into your car trunk or on public transport. However, if you’re looking for a stroller that gives a comfy ride over uneven ground, the Joovy is your best bet thanks to its suspension system that’s lacking in the Triumph. Also, if you want to run local errands, including picking up a few groceries, you’ll find more storage space on the Joovy than the Maclaren.